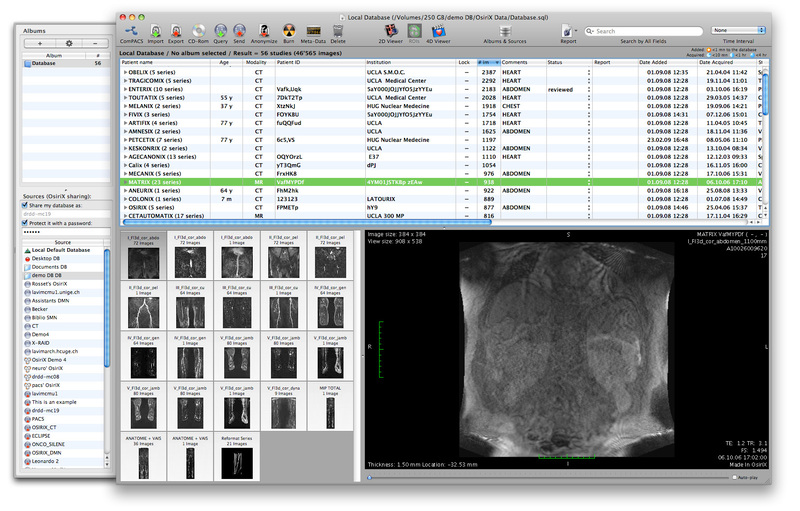 OsiriX for Mac is an image processing & viewer dedicated to DICOM images produced by medical equipment (MRI CT PET PET-CT...) & confocal microscopy (LSM and BioRAD-PIC format). OsiriX for Mac can read many other file formats: TIFF JPEG PDF AVI MPEG Quicktime. OsiriX for Mac is fully compliant with the DICOM standard for image comunication and image file formats. OsiriX for Mac is able to receive images transferred by DICOM communication protocol. ...... imaging modality (STORE SCP - Service Class Provider, STORE SCU - Service Class User, and Query/Retrieve) . OsiriX for Mac has been specifically designed for navigation and visualization of multimodality and multidimensional images: 2D Viewer, 3D Viewer, 4D Viewer (3D series with temporal dimension, for example: Cardiac-CT) and 5D Viewer (3D series with temporal and functional dimensions, for example: Cardiac-PET-CT). The 3D Viewer offers all modern rendering modes: Multiplanar reconstruction (MPR), Surface Rendering, Volume Rendering and Maximum Intensity Projection (MIP). All these modes support 4D data and are able to produce image fusion between two different series (for example: PET-CT). OsiriX for Mac is at the same time a DICOM PACS workstation for medical imaging and an image processing software for medical research (radiology and nuclear imaging), functional imaging, 3D imaging, confocal microscopy and molecular imaging. Qweas is providing links to OsiriX for Mac 3.9 as a courtesy, and makes no representations regarding OsiriX for Mac or any other applications or any information related thereto. Any questions, complaints or claims regarding this application OsiriX for Mac 3.9 must be directed to the appropriate software vendor. You may click the publisher link of OsiriX for Mac on the top of this page to get more details about the vendor.